Zombie movies are normally of a dime a dozen that fill the movie channels nightly. Filled with scantily clad women who scream and stereotypical useless people. It takes a South Korean film to bring back the faith of the genre. Directed by Yeon Sang ho and written by Park Joo sum sets the story on a passenger train for an hour long journey from Seoul to Busan. Well acted it is carefully paced with horror and character development. 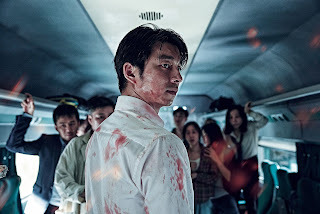 The film had a big midnight screening at Cannes and opened in South Korea breaking box office records. It's well worth the trip to Cine Oasis in Carrollton to catch this train. Gong yoo , the favorite actor of Korean drama Coffee Prince, plays a fund manager Seok woo who is a workaholic divorced dad to Su-an (Kim Su an) who just wants to see her mom in Busan. His mother guilts him into accompanying Su-an on the train. At the same time the train is departing the station there are news reports of some unrest happening in the city. Seok woo is too distracted by the stress of his job that he doesn't notice the news or his daughter who wandered off curious about the conductor checking out a stow a way muttering some thing about everyone being dead. Elsewhere on the train, an injured young woman has also boarded and it doesn't take long before mayhem erupts. These zombies are particularly gruesome. The change happens quickly and they are World War Z fast. Survivors manage to huddle on one car while the major players are established. The pregnant Sung kyunk (Jung Yu mi) and her tough husband Seok hwa (Ma Dong Seok), teenagers Young guk (Choice Woo sik) and his girlfriend Jin hee (An Soon hee), and the selfish paranoid CEO Yong sum (Kim Eui sung). Seok woo at one point tells his daughter to think only about her self when push comes to shove, but despite most peoples inclination for self survival some rise to the occasion to save each other. The claustrophobic surroundings of a train hurtling down the tracks while flesh eating zombies plaster their dead eyed faces against the glass partitions is a bit unnerving. There are terrifying moments when the train stops and people debark looking for safety but finding none there, they get back on the train but some end up trapped. The last portion of the film is a nail biter as a rescue attempt is made and the selfish CEO becomes problematic. While there is so much going on we actually feel for the people involved and not distracted by the usual stupid character that takes one out of the story. This is absolutely one of the best zombie movies ever, a must see, but you may want too drive there and skip the DART.